The group behind the successful campaign to restore funding to Saskatchewan’s provincial libraries is concerned about the latest move from the provincial government: a ‘consultation’ process to review library funding and service delivery. Save Sask Libraries has confirmed the province is currently reviewing library service delivery, legislation and funding, but the consultations only included appointed library boards, with no public participation. Thousands of Saskatchewan residents spoke out against cuts to libraries after the 2017 provincial budget. Library advocates are now concerned that the secretive review process could signal future funding cuts, restructuring or changes in service delivery. When the funding to libraries was restored, then Premier Brad Wall made assurances that any library review would included library patrons and the public. “We know that the public cares deeply about our provincial libraries. The Saskatchewan government should take note of that and ensure that any consultation process that they undertake is transparent, with ample opportunities for public participation”, said Sarah Morden, co-founder of of Save Sask Libraries. 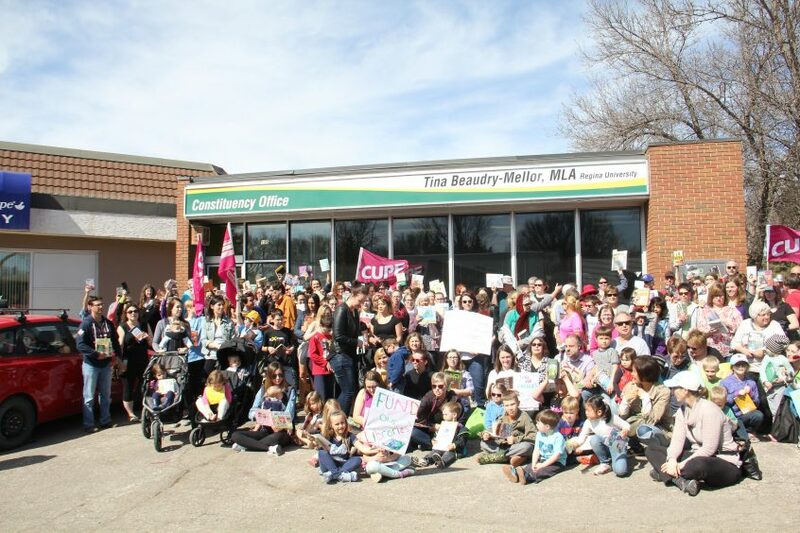 Over 4000 Saskatchewan residents attended 72 communities to participate in “Drop Everything and Read” actions to stand up against the devastating library cuts from the provincial government. 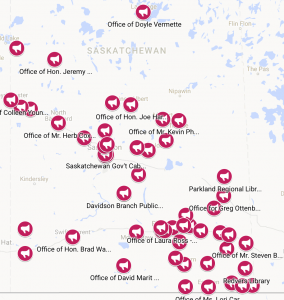 This pan-Saskatchewan event was the largest day of action in recent Saskatchewan history. People from all walks of live rallied at MLA offices, in front of libraries, and in community spaces. The fight to save Saskatchewan libraries will continue. People who are concerned about the cuts are encourage to contact their MLA, to download the various petitions, and to stay informed at www.savesasklibraries.ca. Let your local MLA know you love your library and say NO to these cuts in funding. Bring a book and read outside their office as a group for 15 minutes. This is intended to take place at your local MLA office all over Saskatchewan. Let the Gov’t know that we love our libraries and the proposed cuts are a mistake! There is over 60 events in communities across the province! Find information about an event near you here! If you can’t make it but want to join us, use #Sklibraries and post a picture of yourself reading on Facebook, Instagram or Twitter! 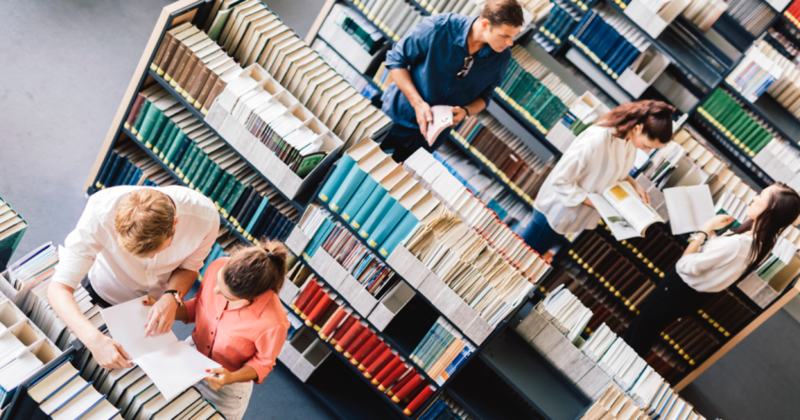 Yesterday, Saskatchewan libraries announced they were eliminating the interlibrary loan program, which allowed library cardholders to borrow books from library regions across the province, knowns as the One Province, One Card approach. During question period at the legislative assembly on April 4th, Don Morgan displayed an astonishing level of cognitive dissonance by stating that the provincial interlibrary loan system should continue. The provincial government’s decision to cut funding for regional libraries by 58 percent, and eliminate funding for public libraries in Saskatoon and Regina is resulting in a loss of many services, including elimination of the interlibrary loan program. The challenges libraries are facing are compounded by the closure of the Saskatchewan Transportation Company. Many libraries depended on the bus services for the interlibrary loan program. To learn more and take action, please visit www.savesasklibraries.ca. 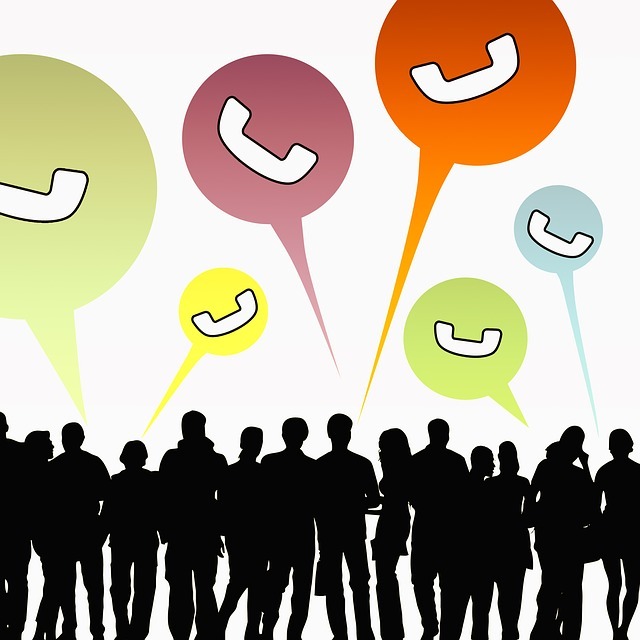 Ring Those Phones – Call your MLA! 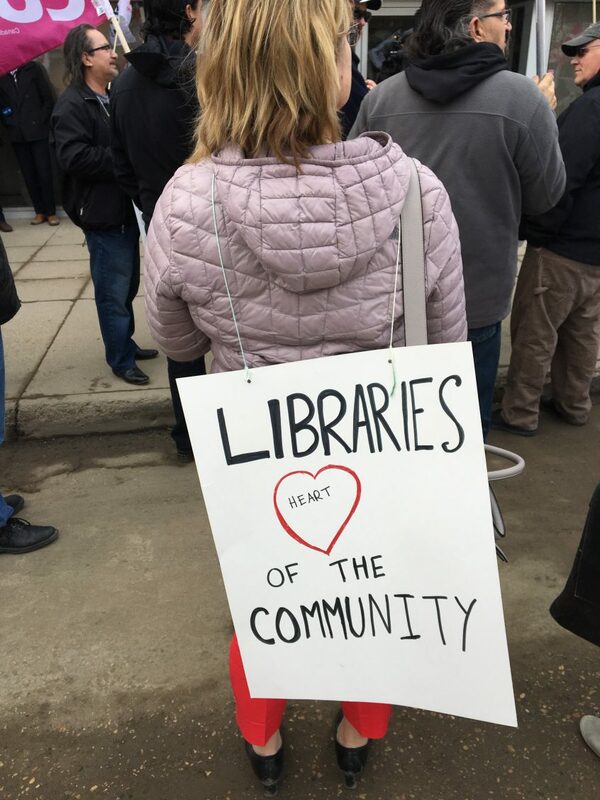 Concerned citizens from across Saskatchewan are standing together to fight back against the Saskatchewan government’s recent cuts to libraries by launching a new campaign, Save Sask Libraries. Since its start as a facebook group on Thursday, over 4,000 people have joined the campaign – and the number keeps growing. Now the group is launching a website (www.savesasklibraries.ca) which features an online letter writing tool and a paper petition drive. The latest Saskatchewan budget eliminated provincial funding for public libraries in Regina and Saskatoon and cut funding for regional libraries in half, or by $3.5 million. A province wide action, “Drop Everything and Read” has been announced. This initiative, scheduled April 7th and shall be organized by local committees. Spearheaded by Leslie Richards, library supporters will gather locally at their MLA offices, to read a book and call upon the government to reconsider their funding cuts to regional libraries. You can learn more about the group and their initiative at www.savesask.libraries.ca or on facebook by searching for the group Supporting Saskatchewan’s Public Libraries. Drop Everything And Read – Support of your local Library! On April 7 at 12:00 p.m., join us for a province wide action to show our support for libraries. Let your local MLA know you love your lib rary and say NO to these cuts in funding. Bring a book and read outside their office as a group for 15 minutes. This is intended to take place at your local MLA office all over Saskatchewan. Let the Gov’t know that we love our libraries and they the proposed cuts are a mistake! While this is a province-wide event, we ask that you organise your own local event. 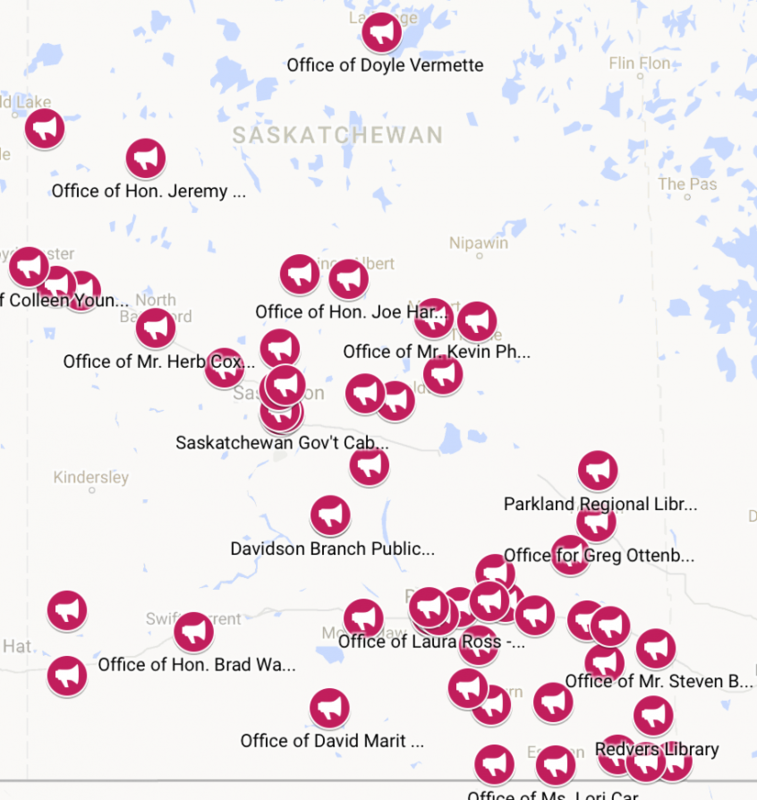 This page is set up to connect you to others within your community and to encourage you to plan an event at your local MLA’s office. Below is a link posted to all the address of each office and the area they cover. This will be a place for local organizers to get materials and support! Yesterday’s budget eliminated provincial funding for public libraries in Regina and Saskatoon and cut funding for regional libraries in half, or by $3.5 million. CUPE is concerned about the impact this will have on libraries across the province – and for the municipalities that suddenly have to plan for the downloading of services. 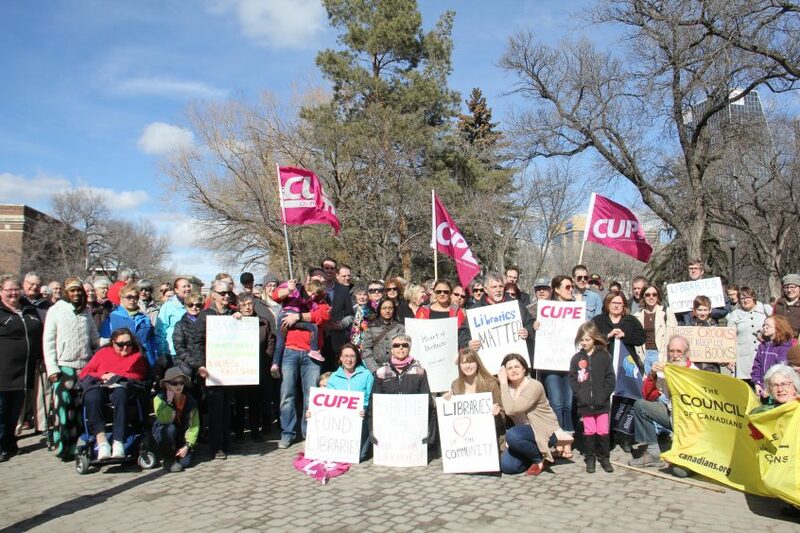 CUPE represents 722 library workers who provide frontline services to residents in six regional libraries across the province and in Regina and Saskatoon public libraries. The primary job classifications are librarian, library clerk, library archive technician, and page. The vast majority of library workers are women (85 per cent), and many library workers are in part time or casual positions. Funding of libraries has traditionally been a joint provincial municipal responsibility. Now the province is downloading more costs onto municipalities, while also cutting other municipal funding such as the Rink Affordability Program, funding for regional parks, and the grants in lieu of taxes program for Crown Corporations. "Cutting Libraries in a Recession is like Cutting Hospitals in a Plague." Eleanor Crumblehulme.